Definition: It is a technique used for the separation of large deoxyribonucleic acid (DNA) molecules by applying to a gel matrix an electric field that periodically changes direction. Developed David C. Schwartz and Charles Cantor at Columbia University in 1984. How is PFGE different from conventional agarose gel electrophoresis? In conventional gels, the current is applied in a single direction (from top to bottom). But in PFGE, the direction of the current is altered at a regular interval. Conventional electrophoresis can separate DNA fragments up to 20 kb. DNA molecules larger than 20kb can be separated by PFGE. DNA fragments of up to ~10 Mb can be effectively separated using PFGE. General procedure is same as conventional agarose gel electrophoresis. The differences are in sample preparation and in direction of current flow. Direction of current: Instead of constantly running the voltage in one direction as in conventional agarose gel electrophoresis, the voltage is periodically switched among three directions; one that runs through the central axis of the gel and two that run at an angle of 60 degrees either side. 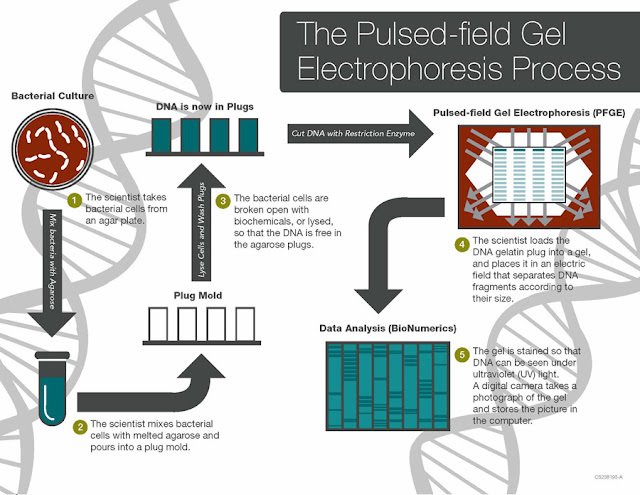 • Pulsed field gel electrophoresis has been used as a means of identifying the genetic defects that cause many hereditary diseases**. • used for genotyping or genetic fingerprinting. • It is commonly considered a gold standard in epidemiological studies of pathogenic organisms. PFGE applied as a universal generic method for subtyping of bacteria. Only the choice of the restriction enzyme and conditions for electrophoresis need to be optimized for each species. Schwartz DC and Cantor CR (1984) Separation of yeast chromosome-sized DNAs by pulsed field gradient gel electrophoresis. Cell 37, 67–75 (original paper on PFGE).